There are many great things about the NonStop Programme. One of my personal favourites is the additional activities they organize. There is a long list you can choose from, or you can do them all. I particularly looked forward to doing the AST (Avalanche Safety Training) course. Being from South Africa, I had very little exposure to snow and therefore avalanches while growing up. Since we started skiing regularly, I have always been fascinated by the amazing power that avalanches have, but have never really gone to any effort to learn more about them. The Avalanche Safety Training gave me a great introduction about avalanches. We learned some very basic tools to help start the learning process in order to travel safely in avalanche terrain. Avalanche risk has three basic elements: unstable snow, suitable terrain and people or property. We learned a bunch of tests to help test the stability of the snow including: Burp test (Shovel tilt test), Compression test (tap test) and Rutschblock test. The interesting thing about snow stability test is that are a good indicator of instability but not really a good predictor of stability. From 1997 to 2007 there were an average of 40 fatalities among recreationists in North America. In Canada the average fatalities are about 14 per year. Avalanches are classed from 1 to 5, with 5 big and strong enough to destroy a town or forest of 40 hectares and would run for multiple kilometres. In western Canada about a million destructive avalanches occur every year. Luckily most of them happen away from property and people. The amazing thing is that people trigger most fatal avalanches. This is usually either the victim or somebody travelling with them. Backcountry travel seems to have grown over the last decade, and I can see the allure it offers. Skiing fresh powder that is thigh deep, away from the crowds, in the peace and quite of the backcountry must be amazing. This week we are planning to go on our first backcountry trip. There are three basic tools that you must have for a backcountry trip to do self-rescue: shovel, probe and transceiver. Airbag backpacks that help you float on top of or near the top of the avalanche is gaining popularity and report up to 98% success rate in surviving a avalanche. The experts say that trips like these are never 100% safe, and it is really about mitigating the risk and finding a safe way to enjoy yourself, based on your level of experience and knowledge. A big part of the challenge is that many of the slopes that offer the best skiing are prime terrain for avalanches. This Avalanche Safety Training Course was just a first step for me to learn much more about this fascinating subject. There is a second level of Avalanche Safety Training that I can hopefully do soon! 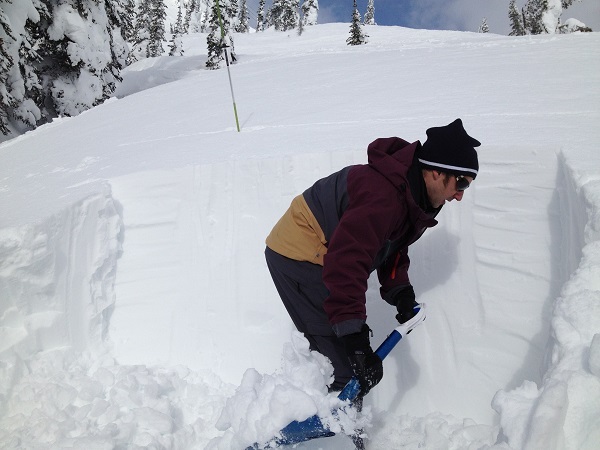 This entry was posted in Fernie, Nonstop Ski Instructors Course on 2013/02/25 by Justinus.